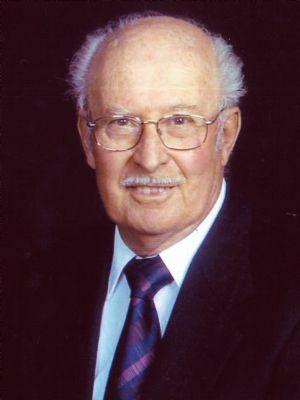 Clarence Mowrer Shenk, 92, of Lancaster went home to be with his Lord and Savior on Nov. 28, 2018. Born in E. Lampeter Twp., he was the son of the late Clarence and Blanche Mowrer Shenk, and the youngest brother of Melvin Shenk, J. Clair Shenk, and Mildred Shenk Herr, all of whom preceded him in death. He was the loving husband of Marian Root Shenk, and they would have celebrated their 70th anniversary in July of next year. Also surviving are: three children, Darlene married to Steve VanOrmer, Strasburg, John married to Frances Leaman Shenk, Lancaster, and Rose Clark, Alexandria, VA; nine grandchildren, Laurie (Lynn) Ressler, Lindsey (Nathan) Frey, Kara (Steve) Scheidt, Jonathan Shenk, Krista (Jordon) Smucker, Brianna (Keith) Brubaker, Susan Clark, Helen Clark, Karen Clark; 12 great-grandchildren. Clarence was a member of Mellinger Mennonite Church, He grew up helping his father on his celery farm and going to Philadelphia markets. After his marriage, he worked 10 years for his father-in-law at Root's Nurseries. He and his wife sold surplus vegetables from their garden from a roadside table, which soon grew into a thriving business selling sweet corn, vegetables and chrysanthemums. A roadside market and greenhouses were built and Shenk's Farm Market was established. Clarence also raised broiler chickens and drove school bus for Conestoga Valley. He played on a senior softball team and later became their statistician. Clarence loved music; was an avid sports fan; enjoyed working on puzzles, but his greatest joy was spending time with his family. He also enjoyed hunting and was a long time member of the Mill Creek Hunting Camp. Funeral Services: 11 a.m. Monday, Dec. 3, 2018 at Mellinger Mennonite Church, 1916 Lincoln Hwy East, Lancaster with viewing from 10-11 a.m. Interment: Mellinger Mennonite Cemetery.